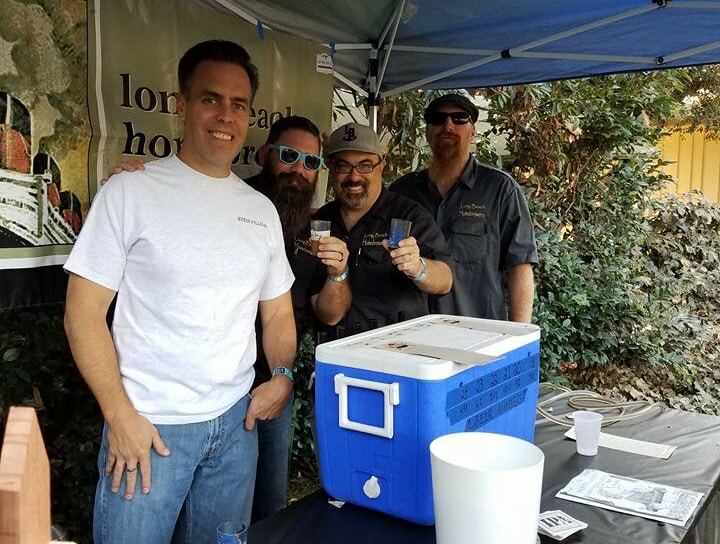 Members of Long Beach Homebrewers at a home-brew festival. Victor Hernandez and his daughter Dalia, have been experimenting in their own kitchen for three years. They measure and mix, concoct and create. They do that which, history books tell us, people have been doing for at least 7,000 years: brew beer. Victor, 60, and Dalia, 29, are part of a growing segment of craftsmen looking to brew perfection. You see, home brewing is no longer associated with old-timey bootleggers, rather, it’s a growing and legal craft enjoyed by many; some of them friends, some of them fathers and daughters. While beer has been brewed by individuals for centuries upon centuries, homebrewing with an alcohol content of 0.5% or higher was made legal in the U.S. in 1978. California law says that homebrewed beer produced without a license in a household can only be used for personal or family uses. So there is no way to legally taste homebrew beer commercially. Well, unless you attend the Long Beach Homebrew Festival this Saturday. Organized by the non-profit organization We Love Long Beach partnered with the Long Beach Brewers club, the event highlights the Long Beach community and the craft of homebrewing with more than 20 brewers at the event. A $40.00 admission ticket provides festival-goers a chance to taste test all brews—none of which are sold commercially—and also partake of food from Shady Grove Foods, Helloha Eats and Shmakee. Now, just so we’re clear, when we’re talking about homebrewing we’re not talking about the craft beer that ends up on tap at your local, hipster dive. No, homebrewing is the brewing of beer, cider or mead on a small-scale, strictly for personal, non-commercial use. Homebrewing is a craft all it’s own, where creativity and experimentation is not only encouraged, but critical. Different fruits and spices like strawberries or lemongrass can be added to enhance a beer. Or a different strain of yeast can be added to make a whole different flavor. Victor and Dalia have been working with hefeweizen and pale ale, experimenting with different flavors including guava. When the pair visited Long Beach Homebrewers for the first time, they had others taste-test their homemade beer. Dalia was the one who found the club but Victor at first hesitated sharing their creations. Victor relented and soon they’d joined the club. Long Beach Homebrewers, founded in 1990 gives homebrewers a chance to meet other brewers and get feedback on their beer while trying others made by the members who don’t have to be from Long Beach. Victor and Dalia are from Costa Mesa. Robin Jones, We Love Long Beach Associate Director and coordinator of this year’s homebrew event, started the festival three years ago when she discovered that a colleague, Andi Svenney-Hakim, who’d worked on one of their citywide events, was in fact a homebrewer herself. Never having fundraised for the organization, she thought this would be a great way to showcase something that’s a little different from the norm. Community is a theme with the festival. Started in 2008 by Jones and her brother, the non-profit aims to connect neighbors together to create better safety and quality of life in communities. After a couple of years of throwing neighborhood breakfasts, the duo decided to put on more city-wide events like Homebrew Fest while encouraging others to host their own smaller events on their block. Ray Grace, current president of Long Beach Homebrewers says that some of the members find out about the club through the festival. A sense of belonging is what the festival and We Love Long Beach aims to achieve through the festival. Tickets and information for Homebrew Fest are available on the We Love Long Beach website at welovelb.org.